I wrote a while ago about a young autistic boy who went missing in Queens. Months went by and no sign until this week when his remains were found on a beach in Queens. The reporting in the New York Post was shockingly graphic and I don’t think you would ever see such detailed descriptions in the UK press. I often thought about Avonte, wondering what happened to him. Now at least his family knows and can say goodbye. Rest in peace, Avonte Oquendo. Categories: Newspapers | Tags: Avonte Oquendo | Permalink. 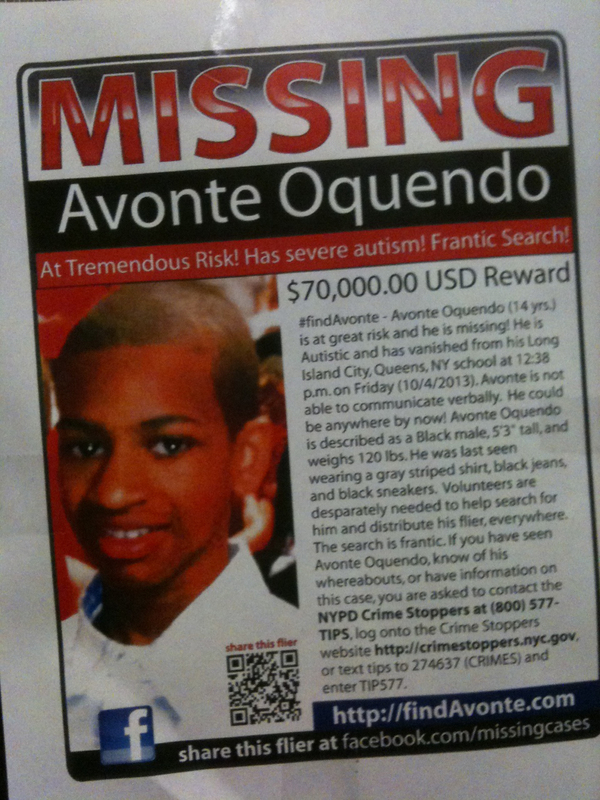 Avonte Oquendo is a 14 year old autistic boy who has been missing since 4 October. The reason I know about him is because his face is plastered all over New York (see the snap of the poster on the subway below). It is all over the subways in particular because he has a fascination with trains. He disappeared from his school in Long Island City and hasn’t been seen since. The MTA who run the subways have regular announcements over the tannoy about him; the dot matrix boards interrupt messages about imminent train arrivals with more messages about him. I think by now everyone knows about Avonte and yet he is still missing. I have never seen such an effort on the London Underground and am impressed with this. I see from today’s New York Post that the reward for his safe return has risen to $85,000. I hope it works. Categories: People, Using the subway | Tags: Avonte Oquendo, Missing child, MTA, New York Subway | Permalink.